This paper continues my previous work on the ontological aspect of articulation by focusing on analogical reasoning’s revelatory power in argumentation that seeks truth in Heidegger’s sense of “aletheia,” or “uncovering.” But that concept easily suggests a realist, in contrast to constitutive, basis for inquiry. Thus my initial task is to delineate the contrasts between realist and constitutive ontological starting points, in relation to dramatically different expectations as to what analogical arguments may accomplish. My further task concerns the implications that follow from acknowledging that these expectations are embedded in constitutive rather than realist ontologies; namely, we must assess their truth value by standards other than those more traditionally used in argumentation theory. In this paper I pursue only the initial task. The titles I use for the two orientations rely upon John Dewey’s identification of philosophy’s “proper task of liberating and clarifying meanings” as one for which “truth and falsity as such are irrelevant” (1925/1981, p. 307). Yet Dewey modifies that separation of “meanings” and “truth” by his recognition that “constituent truths,” in contrast to “ultimate truths,” rely on a “realm of meanings [that] is wider than that of true-and-false meanings.” My thesis, then, is that analogical reasoning’s value lies in uncovering alternate meanings by using the implicit “background knowledge” that’s intrinsic to any communicative situation. That knowledge includes “intuitive connections” that shape “wider” meanings – those meanings that propose “constituent truths” – and so “facilitate the development and extension of thought.” For that process of developing alternative possibilities and extending conventionally accepted meanings, I suspect, is crucial for that little-understood process we call changing our minds. There may well be an historical shift in interest in, and even preference for, each of these two modes of argumentation. Ronald Schleifer finds that “some time around the turn of the 20th century a new mode of comprehension arose,” which supplemented those “received Enlightenment ideas concerning the nature of understanding and explanation” as culminating in Cartesian ideals of “‘clear and distinct ideas’ and the large assumption, central to Enlightenment science from Newton to Einstein, that the criteria for scientific explanation entailed . . . accuracy, simplicity, and generality” and which understood “reduction and hierarchy to be the ‘methods’ of science and wisdom” (2000, p. 1). The “analogical thinking” that “supplemented without replacing the reductive hierarchies of Enlightenment explanation,” Schleifer continues, relies upon “metonymic series rather than synechdochial hierarchies”; more specifically, it encourages thinking in concrete and particular terms, rather than abstract and universal terms – and thus, valorizes an orientation toward the particular and transient, rather that the universal and stable; toward complexity and plurality, rather than simplicity and univocity (pp. 8-9). “Analogical knowledge,” Schleifer reminds us, “is irreducibly complex. It traffics in similarity and difference that cannot be reduced to one another,” and so “suspends the law of excluded middle” (pp. 14-15). It “embodies the serial work of the negative” in proposing relations, similarities, and differences that may be discerned in “momentary or emergent insights” (p. 24). Without requiring rejection of that conception of knowing and being, analogical thinking – particularly as carried out in analogical argumentation that marshals premises in support of a conclusion – seeks to comprehend the complexity of matters. Within this alternate mode of comprehension, inquiry is oriented toward uncovering how matters might be, rather than positing propositions that correspond to what things are. A multiplicity of meanings emerge in the interaction between (in Kenneth Burke’s terms) “beings that by nature respond to symbols” (1962, p. 567) and the elements that engage those beings’ attention. For those beings – we who essentially and extensively engage in communicative action – evoke an apparently inexhaustible wealth of perspectives on, and ways of assigning meaning to, elements that engage our attention. In so doing, we constitute a multiplicity of ways that matters could present themselves to us and ways that we, and they, could be related. Comprehending human being as using our symbolic capacities in constitutive, rather than representational, ways enables us to recognize the goal of analogical argument as inducing cooperation among distinctly diverse beings who devise ways of signifying what engages their particular attention, from within their particular perspectives and in relation to their particular goals. The meanings that emerge from the interaction between symbolically active beings and their environments range in plausibility from possibility to probability, and each of us seeks to induce others’ consideration of, and even, identification with, those meanings that win our adherence – even, transiently. Karlyn Kohrs Campbell, in what may be the earliest explicit consideration of distinct ontological assumptions underlying rhetorical theory, emphasizes that a focus, such as Burke’s, on human beings’ symbolic abilities encourages investigation of “the rhetorical dimension present in all language use” (1970, p. 105) rather than delineating discourse that articulates a perspective as worthy of consideration as either “logical argumentation” or “rhetorical persuasion.” Contrary to ontological assumptions that understand human being as primarily rational or volitional, cognitive or affective – and so, inspire rationalistic or behavioristic theories of human being – she proposes understanding human being as intrinsically symbolic. She grants that doing so sacrifices the “neatness and order” offered by the “analytical and empirical perspectives” adopted by (formal) logic and (physical) science. What’s gained, I would add, is appreciation of the argumentative dimension of communicative action as informed by analogical as well as propositional characterizations. Further, what’s enabled is recognition, in Thomas Farrell’s words, that “every major institutional practice associated with a vital public sphere . . . seems to embody the creative strain of reason which we call rhetorical art” (1993, p. 237). That “creative strain of reason” seems to me to be especially exercised when we devise analogies to argue for how things both are and are not related to other things. We can now look more closely at some examples that illustrate how analogies work to develop and expand thought. Analogies, in contrast to propositions, persistently signify both what is and what is not; or, what may be and what may not be the case. Assessing the value of a particular analogy requires us to look beyond the concepts that it joins via tentative and transient relation in a particular situation. But this looking “beyond” the particular situation in which the analogy is proposed involves looking into the background and goals that may be operative in proposing that analogy, while refraining from positing causal efficacy between background and analogical relation, or between analogical relation and goals – and also, refraining from positing general (even, universal) hierarchical structures. Empathy (an expressive attitude; Habermas’s third category) is articulated here not by approximating measurement of a property (such as “I felt a strong sense of empathy with Smith”) but by identifying a process (leaving the shared house by doors that connote positive and negative relation with the inhabitants) that reaches into another domain for explanatory efficacy. The terms that are used evoke our understanding, which may be quite vague, of growing up within the same household (i.e., environment), but leaving that physical and social commonality in either a positive (author) or negative (murderer) way. Thus the response sketches a connection, rather than describing a propositional state of affairs, and so may invite reflection on the relation between upbringing and character development. The analogical relation here is provided by only one element in the target – Mr. Cheney’s behavior in this incident, but not his size, or age, or particular office – in relation an element in the source – practices in which we ourselves, or others in our experience, may have engaged. Such first-person or hearsay evidence provides supporting, although uncertain, evidence: Sometimes, although not certainly, what remains unspoken remains unnoticed. Here also, understanding comes by way of sketching a process (remaining quiet about an accident) and relation (vice president or teenager to audience, whether immediate family or voting public) rather than through describing a propositional state of affairs, and so may invite reflection – in this case, on the possibility of recognizing other immature actions by this, or other, government figure. The analogical relation here is one that’s immediately re-evaluated by the speaker, who shifts the relation involved from one of adventuresome or brave action to that of foolish and even self-destructive action, and so indicates unwillingness to adhere to, or continue to identify with, his own proposal for relation based in similar action. Here again, one element – this time, an explicitly temporal one, being first into a situation – provides the basis of similarity. When that element is re-assessed negatively, the speaker rapidly retracts the analogy. A listener may, however, wish to retain the analogy in order to suggest that Mr. Kelman’s firm is, so to speak, shooting itself in the foot by taking the lead in bringing about the demise of its own industry. By extension, Churchill continues, “American citizens now” are analogous to “good Germans of the 1930s & ’40s” in regard to a set of practices that constitute only one element of their being: U.S. citizens’ “complicity” in accepting the consequences of government standards for “‘justified . . . collateral damage'” (namely, “economic sanctions” leading to the death of civilians) which he proposes is analogous to German citizens’ complicity in accepting the consequences of Nazi racial standards (namely, genocide). The controversy provoked by Professor Churchill’s analogies illustrates the intense complexity of language choice, and thus, of communicative action, in comparison to the relative simplicity of Habermas’s fourth category, language. 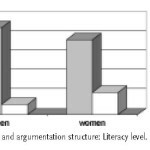 That is: in contrast to the validity claim of truthfulness in regard to disclosing one’s subjectivity, or rightness in regard to establishing interpersonal relations, or truth in regard to representing nature, Habermas links language to a validity claim of “comprehensibility.” Yet there is an intellectual and emotional space that separates comprehensible linguistic formulations such as propositions that can be assessed through traditional standards for argumentation, from communicated symbolic action that is evaluated by the standards of analogical argumentation. The importance of that space is suggested by Churchill’s reminder, in the response from which I take the particular terms I’ve quoted here, that his “analysis . . . presents questions that must be addressed in academic and public debate.” That is, he is sketching a perspective that invites – even demands – reflection on the extent of similitude between the processes and events he evokes from our background knowledge in relation to certain current events, rather than proposing a description of any entity. Earlier, I quoted Juthe’s characterization of analogical argumentation as that which proposes “a correlation or an intuitive connection based on our experience and background knowledge” (2005, p. 15). The relatively acceptable analogy underlying Churchill’s contentious claims relies upon background knowledge that is at least vaguely familiar to generations not far removed from an agricultural economy: chickens let out into the barnyard will return to their nests. Also, it evokes language familiar to adherents of major faith traditions in the U.S., who have some degree of adherence to the principle that the sins of the fathers are visited upon the children, or, that human beings reap what they sow. More abstractly stated, actors cannot expect to avoid the consequences of their actions. More contentiously than in the first three examples we’ve considered, Churchill’s argument, by weaving analogies together, uncovers connections, relations, and correlations that may be as resistant to complete rejection as they are reminiscent of background knowledge to which we give implicit, and perhaps only partial, adherence. In contrast to epistemic orientations that traditionally valorize clear and distinct ideas, articulated in propositional form and evaluated by means of traditional logic, analogical argumentation is ontologically efficacious. This is not to say that communicative action creates a natural, or social, or even individual state of affairs. It is to propose that analogical argumentation performs the constitutive function that Lloyd Bitzer identified with rhetoric’s functioning as “a mode of altering reality, not by the direct application of energy to objects, but by the creation of a discourse which changes reality through the mediation of thought and action” (1968, p. 3). 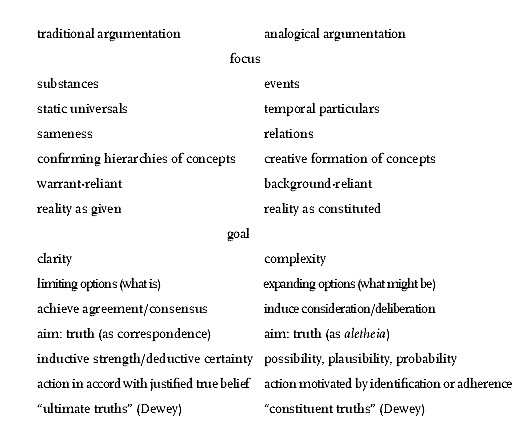 Or, to return to the quotation from Perelman and Olbrechts-Tyteca with which we began: analogical argumentation, and particularly the type of analogy that Juthe calls “incomplete” – which would include the four examples we’ve considered here, all of which rely on highlighting one element in the many that constitute any event – enables the “development and extension of thought” by (in Juthe’s words) by foregrounding elements that “determine . . . only probably and not definitely,” and so evoke “only a correlation or an intuitive connection, based on our experience and background knowledge” (2005, pp. 14-15). i. The epigraph is from page 385.
ii. The particular impetus for these remarks on the nature and value of analogical argumentation, by way of reconsidering the ontological assumptions underlying diverse assessments of that value, comes from an event within the contemporary US-American educational context. The Scholastic Aptitude Test (SAT) is created and administered by a private corporation, The College Board, and used by most US colleges and universities (with diverse levels of reliance) for determining admission to their institutions. The 2005 edition of the SAT replaced the segment that measured analogical reasoning ability with an expanded segment the measures writing skills. I have argued elsewhere (Langsdorf 2005) that argumentation theorists and teachers ought to join their colleagues in composition in urging reconsideration of that change. In this paper, I focus on a question that’s implied by that proposal: just why is analogical argumentation valuable for communicative action? In other words, my focus here is on the value of analogical argumentation for the informal logic-in-use in mundane communication, in contrast to the formal logic that characterizes abstract conceptualization. v. The fullest development of Churchill’s argument is in his widely circulated essay (Churchill, 2005) although the responses to it may well rely upon excerpts from that source or the number of articles and speeches he has given which repeat the contentious phrases. And White House shoots foot (editorial). (2005, February 14). The New York Times. Retrieved June 10, 2006, from http://select.nytimes.com/search/restricted/article?res=FB0916F9395A0C778DDDAB0894DE404482. Baron, C. et al. (Producers). Capote [Motion picture]. United States: UA/Sony Pictures Classics. Bitzer, L. (1968). The rhetorical situation. Philosophy and Rhetoric 1, 1-14. Burke, K. (1962). A Grammar of Motives and A Rhetoric of Motives. New York: Meridian. Campbell, K.K. (1970). The ontological foundations of rhetorical theory. Philosophy and Rhetoric 3, 97-108. Churchill, W. (2005). “Some people push back”: On the justice of roosting chickens. Retrieved June 10, 2006, from http://www.kersplebedeb.com/mystuff/s11/churchill.html. Dewey, J. (1981). The Later Works, Volume I: Experience and Nature. Jo Ann Boydston (Ed.). Carbondale: Southern Illinois University Press. (original publication 1925). Habermas, J. (1984). The Theory of Communicative Action Volume One, trans. Thomas McCarthy. Boston: Beacon Press. (original German publication 1981). Juthe, A. (2005). Argument by analogy. Argumentation 19, 1-27. Langsdorf, L. (in press). Arguing for analogy: On recognition vs. invention in the new SAT. In P. Riley (Ed. ), Selected Papers from the Fourteenth NCA/AFA Conference on Argumentation, Washington D.C.: National Communication Association. Langsdorf, L. (2005). Argumentation by articulation: Implications of an ontological assumption. In C. Willard (Ed. ), Proceedings of the Thirteenth NCA/AFA Conference on Argumentation (pp.18-37), Washington D.C.: National Communication Association. Langsdorf (2002a). How narrative argumentation works: An analysis of argumentation aimed at reconsidering goals. In: F. van Eemeren et al. (Eds. ), Proceedings of the Fifth International Conference on Argumentation (pp. 665-670), Dordrecht: Foris Publications. Langsdorf, L. (2002b). 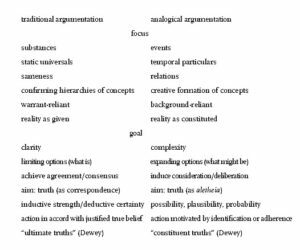 Reconstructing the fourth dimension: A Deweyean critique of Habermas’s conception of communicative action. In: M.Aboulafia et al. (Eds. ), Habermas and Pragmatism (pp.141-164), New York: Routledge. Langsdorf, L. (2000). The real conditions for the possibility of communicative action. In L.E. Hahn (Ed. ), Perspectives on Habermas (pp. 21-50), Chicago: Open Court. Perelman, C. (1982). The Realm of Rhetoric. Notre Dame: University of Notre Dame Press. Perelman, C. & Olbrechts-Tyteca, L. (1969). The New Rhetoric: A Treatise on Argumentation, trans. J. Wilkinson and P. Weaver. Notre Dame: University of Notre Dame Press. ISSA Proceedings 2002 – Persuasive Success And Normatively-Desirable Argumentative Conduct: Is It (Persuasively) Bad To Be (Normatively) Good? ISSA Proceedings 2010 – Hidden Premises, Hidden Treasures? ISSA Proceedings 2006 – Adam Smith’s Ad Hominem: Eighteenth Century Insight Regarding The Role Of Character In Argument.